Picture a living room somewhere in Missouri on a Saturday. A group of men, casually dressed and munching on pizza, sit in a loose circle quietly writing. The scratch of pen on notepaper or the click of laptop keys is the only sound in the room. At one point, an older man among them interrupts the writing and suggests they share in pairs what they’ve written. Suddenly the room is alive with sound, as the men talk animatedly, gesturing with hands and nodding heads as they relate experiences from their professional lives. The living room belongs to Roy Fox, director of the Missouri Writing Project, and this is a typical meeting of the Mizzou Men for Excellence in Elementary Teaching. Fox and Associate Director Amy Lannin have sponsored these gatherings as a means for men who teach in elementary schools to inquire together into that shared experience. Some of these participants have driven two hours to be part of this group—which is no surprise given the scarcity of men in elementary schools. The U.S. Census Bureau indicates that 79 percent of middle school and elementary teachers are women. In fact, many elementary schools have no male teachers at all. And perhaps worse, in some the only male staff member in the building is not a teacher but the principal or the janitor. As Jawanza Kunjufu (author of Countering the Conspiracy to Destroy Black Boys and Black Students, Middle Class Teachers, and numerous other publications) and others have pointed out, this lack of men teaching in elementary schools often means that boys have no role models for success in school. To complicate matters, male teachers frequently deal with issues such as isolation, perceptions about their sexual identity, stereotyping, and clashing expectations. Fox and Lannin felt that their writing project site could do more to recruit and support men who were considering or had decided on teaching elementary grades. Beginning modestly with three teachers, the group’s membership has grown to ten over three years, with two of the original three teachers still participating. The overall focus of the group is to mutually inquire into issues, troubleshoot them, and help teachers carry back approaches and strategies to the classroom. As Fox notes, each session builds upon tried and true writing project activities that enable teachers to take a reflective stance on practice: journaling, protocol-led discussions of readings and videos, inquiring into issues, and providing feedback. Participants have read books such as Raising Cain: Protecting the Emotional Life of Boys and watched videos such as Wrestling with Manhood, all with the intent of bringing issues and questions to the surface. 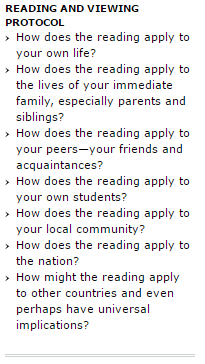 Over time, they have continued to use the same protocol for response to readings and viewings, allowing them to collect an interesting set of data (see “Reading and Viewing Protocol” below). The stories shared by the teachers reflect some of the things that happen when a man finds himself in a culture made up predominately of women. Simple acts take on new meaning. One participant spoke of picking up his mail from his school inbox and noting that every inbox except his held an invitation to a baby shower for one of the women teachers. Although he wasn’t sure if he would have gone if invited, he felt that not being invited was one more way to make him feel excluded from the social community of his colleagues. Other stories had even more complex implications. When a parent called and asked one of the male teachers to help her son tie the scarf for his Halloween costume, he readily agreed to comply. He thought nothing of it until he was called to the principal’s office the next day to find out that the parent had requested that her child be removed from his classroom. She said his scarf-tying prowess indicated that he must be homosexual. Sharing the exploration of such issues not only provides a space for probing these concerns, but also immerses the participants in the fundamentals of establishing a reflective practice. Fox and Lannin saw a Teacher Inquiry Communities Network grant as a means not only to sustain and extend their efforts, but also to share what they were learning with others. One idea they have is to create region-based groups so that teachers in Kansas City won’t have to drive across the state in order to participate and so that more teachers can participate. Such groups could remain centrally connected to each other through the blog system already in place and used by current participants to communicate between sessions. Fox and Lannin continue to work with the participants to analyze the session transcripts and writings in order to better understand the struggles and successes of men who teach in elementary schools. Like all good research, the work of the group is to identify themes that raise new questions. What does it mean to be seen as the disciplinarian of “problem” children simply because you’re the only male in the school? Should a teacher discourage the reading of literature that is rife with fantasy violence, even though it engages many young male readers? What are the implications and ramifications of ongoing isolation in the workplace? Do male and female teachers solve problems differently? How can teachers make reading and writing more engaging for boys? Participants are developing computer slide presentations based on their inquiry into these questions. Their immediate audience is each other, but they seek to extend that audience to educational stakeholders and policymakers. Mostly, however, they want to continue to support one another as they seek to become better teachers of young children.